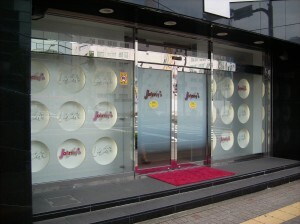 I made a trip to visit the Johnny's Shop in Nagoya last week. 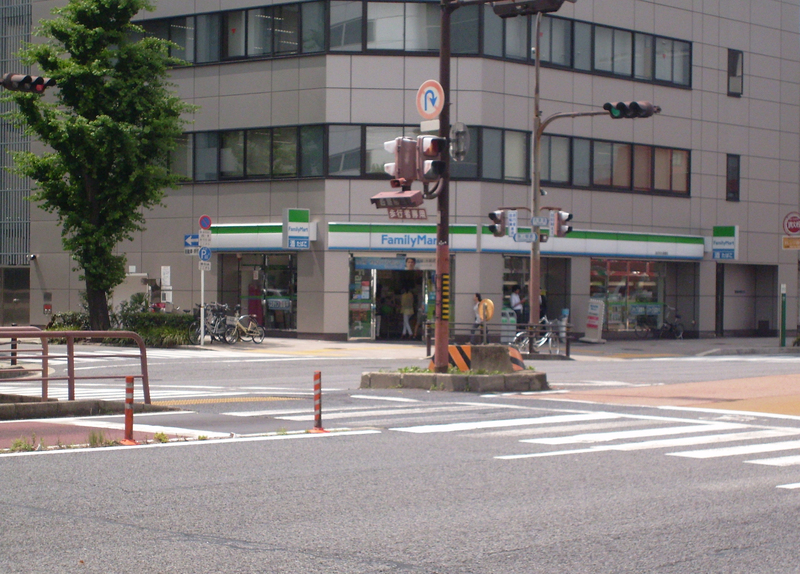 It's moved to a different location since eggchan's post, so I took pictures along the way to make an updated post. 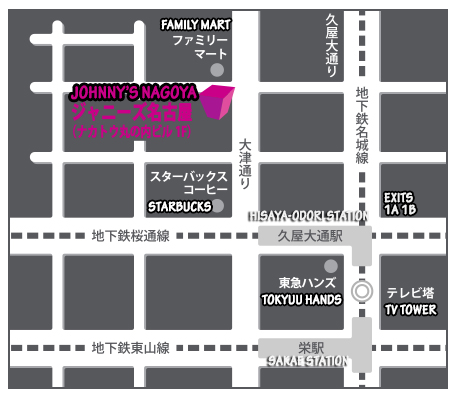 Here is the map from the Johnny's site, which I found more helpful than their written directions. I translated the landmarks on the map for you. If you're worried about reading other signs, don't worry. Most signs, especially for the subway system, also have writing in english. I exited the subway station at the Hisaya-odiri station of the Meijo line. 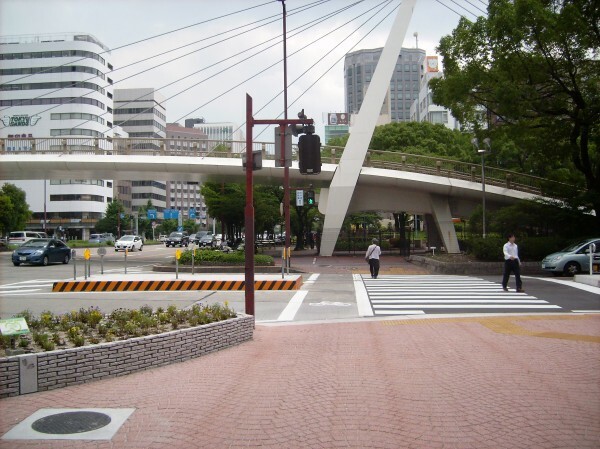 (It's also within walking distance of Sakae station, if you're coming in on the Higashiyama line and don't want to transfer.) The directions from the Johnny's site mention exiting at Exit 1, which I could never find from inside the station, so I followed the signs for 1A 1B. When you exit the station at 1A or 1B, turn around and you'll see the TV Tower. 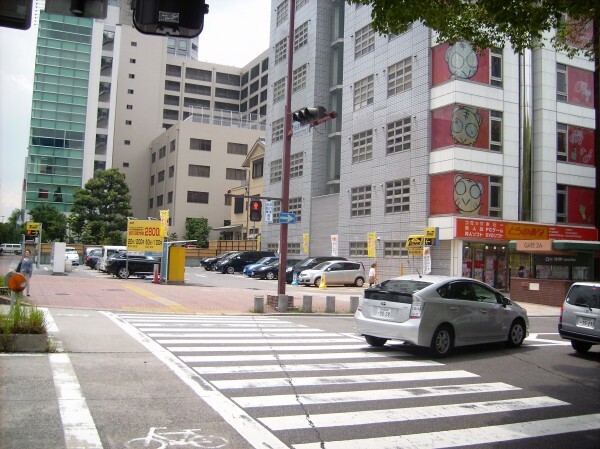 Stand at the intersection so that the TV tower is on your left. Cross the intersection so that you're going by a park area, under the bridge and a group of trees. Cross the next intersection as well. Keep going until you see the Starbucks on the corner. 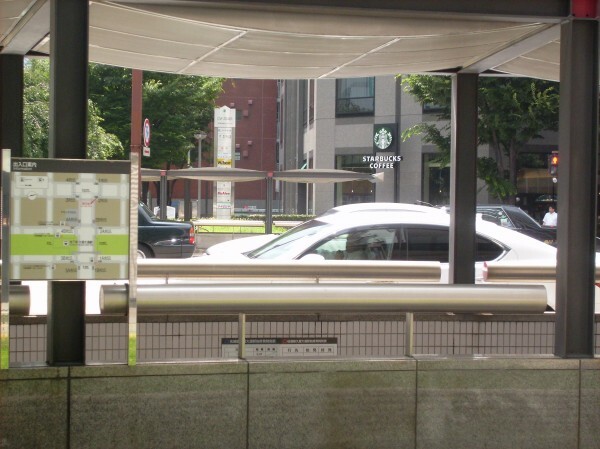 The subway entrance shown in the picture is actually Exit 1, so if you manage to find that from within the station, this will be your starting point. You can cross the street either at Starbucks or later. Either way, turn right at this intersection and follow the street for two blocks. You will see an intersection with a Family Mart on the corner. The Johnny's Shop is right across the street from the Family Mart, shown by the small yellow sign with pink writing. Cameras are not allowed inside the shop, so I can only give you written instructions from here. Go in the front doors. 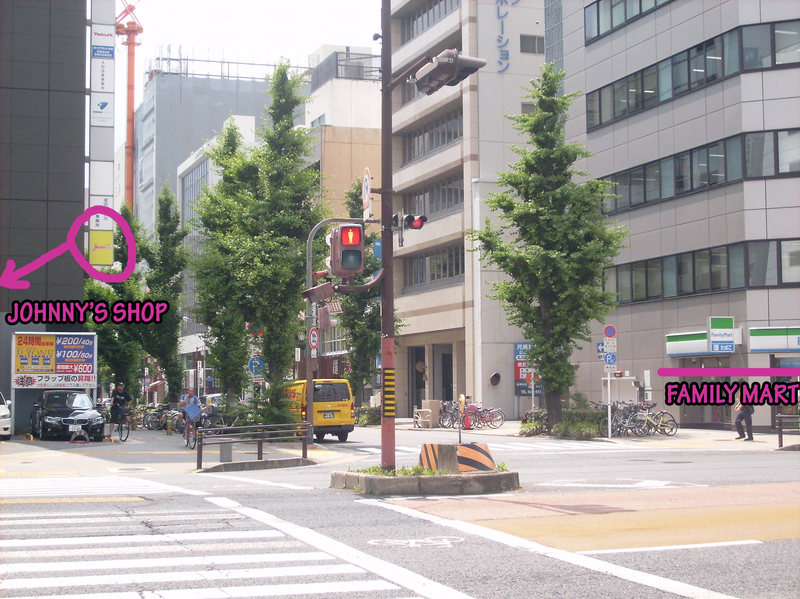 When you go inside, there's a stand with the forms and pens to fill out which shop photos you want, one sheet per group. The photos are on the left side of the room. The employees are very helpful and can produce a sheet with instructions in English if you need help in filling out the form. One you have looked at the pictures to your heart's content and filled out your sheet, go through the queue to your right. 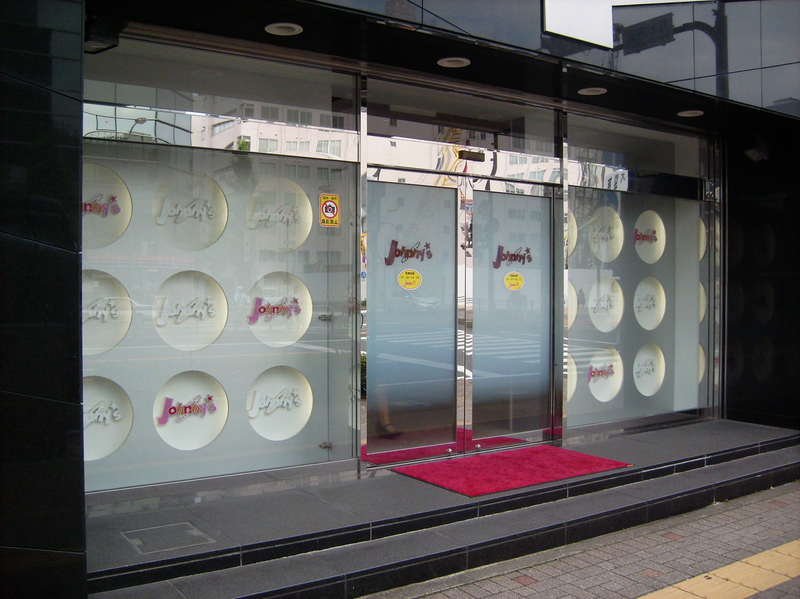 You'll see glass cases with other miscellaneous goods for sale. When it's your turn, hand the sheet to the employee at the register and they'll ring up your purchases, get the pictures, and then lay them out in front of you to make sure that you got the right ones. Currently, their hours are 10:30am～6:30pm. I had heard in the past that they're closed on Wednesdays, but I'm not sure if it's true anymore since it doesn't mention anything on the website. I went in the early afternoon on a Thursday and got in with no problem and no waiting in line. 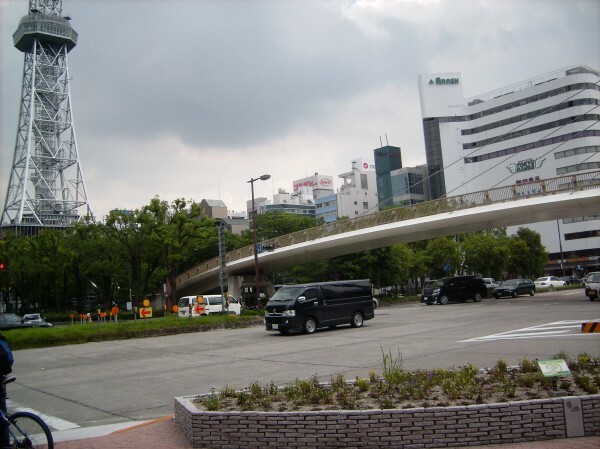 I've just moved to Nagoya and it is very helpful! I will go there shortly!